In January, Lyft closed a $1 billion funding round that valued it at $5.5 billion and included a $500 million commitment from General Motors. Since then, Lyft has spent furiously to compete with Uber in the US. Its promotions have included expansive billboard ads in New York’s Times Square, half-off fares for riders in major metro areas, and $50 vouchers for new riders. In April, Bloomberg reported that Lyft had promised investors to cap losses at $50 million a month. At the time, Lyft cofounder and president John Zimmer said the spendthrift strategy was working. “We’re gaining share in all top 20 markets, which is where 80% to 90% of rides happen, ” he told Bloomberg. The data were less clear: Lyft claimed to have 45% of the ride-hailing market, by trips, in Austin and Los Angeles, and 43% in San Francisco. Uber said it had 55% market share in Austin, 75% in Los Angeles, and 66% in San Francisco. One market where the companies can be more easily compared is New York, as the local taxi authority requires all ride providers to submit data on trips and then publishes weekly summaries. Here, Lyft has promoted its service aggressively for weeks, with everything from $4 discounts to subway ads. 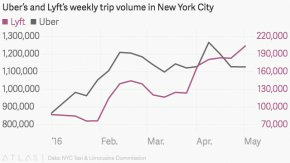 On the one hand, the latest report from the Taxi and Limousine Commission suggests the strategy is working: Lyft’s weekly volume grew 20% in the month of April, while Uber’s stayed flat. On the other, Lyft’s best-ever performance in New York in the last week of April—some 200, 000 trips—remains less than a fifth of the 1.1 million rides Uber did that same period. Lyft’s decision to hire Qatalyst could signal that it is pursuing a sale, or simply that it needs more money. For all that ride-hailing was pitched as an efficient, asset-light business, making it work has proven incredibly cash intensive as companies vie for both riders and drivers. In this arena, Uber is clearly winning. The company has sealed three new deals since the start of the year, including a $3.5 billion investment from Saudi Arabia’s Public Investment Fund. Uber is also reportedly looking to raise as much as $2 billion from the leveraged-loan market. Small wonder if Lyft is struggling to keep up.